We talked with inventor Eric Gradman about his awesome new endeavor! Recently, Eric Gradman, a prototyper, lifelong inventor, and friend of SparkFun, sent us an awesome new project. His company, Two Bit Circus, is running a Kickstarter to fund the creation of the STEAM Carnival, a modern traveling carnival with high tech games, robots, fire, and lasers to inspire young inventors in science, technology, engineering, art, and math. Once we all calmed down, we asked Eric a few questions about the project and how it came about. Can you tell us a little bit about yourself and your background in electronics and STEAM? I'm the CTO and co-founder of Two Bit Circus. My background is in robotics and rapid prototyping; that makes me something of a jack-of-all-trades around here. Nowadays I call myself a professional inventor (well, and ringmaster). If that isn't the best job title ever, I don't know what is. I've always had a strong passion for electronics. I write software and I do mechanical engineering, but I think electronics is what really brings a project alive. I've been creating interactive art, crazy prototypes, and "stunts" for years. I came to discover that creations with strong element of fun excite people the most. They also excite me more to design! What is Two Bit Circus all about? What are some other projects you guy have done besides the STEAM Carnival? Video games are growing exponentially more elaborate and engaging, but out-of-home activities with friends haven't changed in nearly a generation. Would you rather go bowling, or experience an immersive live-action story, complete with projected effects, lasers and mechatronics? 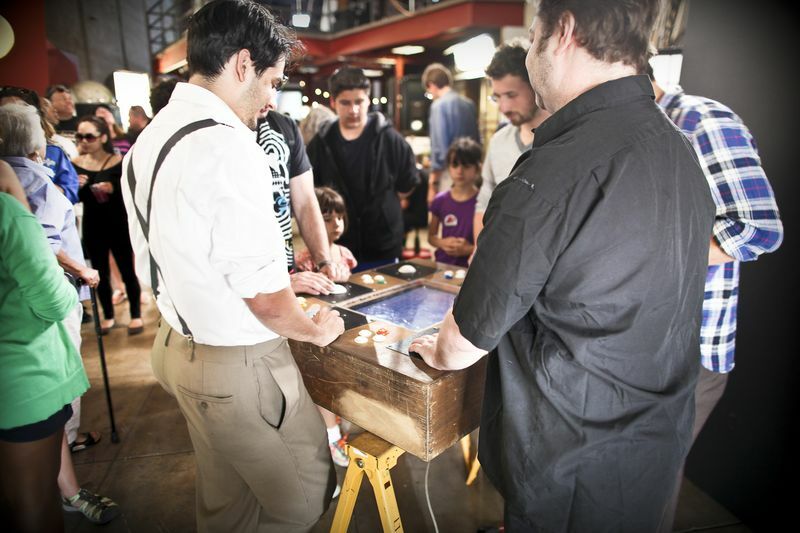 At Two Bit Circus we build unconventional out-of-home amusement and entertainment products. A recent project (called Virsix) is a permanent installation at an enormous, family-friendly hotel. A team travels together through a series of four rooms, engaging with virtual characters and solving challenges together. We're showing people a fun time they can't get anywhere else. 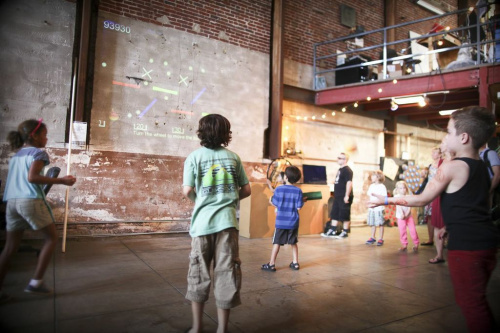 Both Virsix and the STEAM Carnival depend heavily on the fun games and inventions we build every day; things like the Gantry Crane Redemption robot - a gesture-controlled, six-foot-by-three-foot, two-and-a-half axis robot for grabbing toys. Or the party-table, a custom video game system played in the round by up to six people. How did the idea for the STEAM Carnival get started? 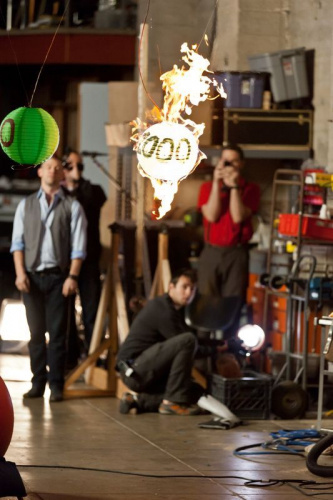 We've spent years making making crazy, high-tech inventions and stunts. Some of them - like OK GO's Rube Goldberg music video for "This Too Shall Pass" - really blew up online. It's been viewed almost 40 million times. We got constant feedback from teachers and parents thanking us for having inspired their kids about STEAM in a way their schools had failed to do. It got us thinking - can we produce an event that generates that same excitement? Well, everyone loves a carnival, so it seemed like a natural way to tie together the many fun projects we were building, and inspire kids to pursue careers in science, technology, engineering, art, and math. How will the carnival work? The carnival is likely to take place in a fairground, with a big-top tent at its center. Like any event at a fairground, you'll find some familiar things: contests, prizes, tasty food, and live entertainment. But there will also be robots, lasers, and high-tech games like nothing you've ever seen. We spend all day every day dreaming up crazy games and other ways to show you a good time. For the first time, we'll have it all in one place. The carnival is going to start in Los Angeles and San Francisco next spring, but we really want this event to reach as many people as possible. I love Boulder, and I would love to take the Carnival there soon! What materials were used when building the various parts? Any SparkFun parts in there? I've been a SparkFun customer since Nathan was shipping out of his apartment, and SparkFun parts play a huge role in what we do. 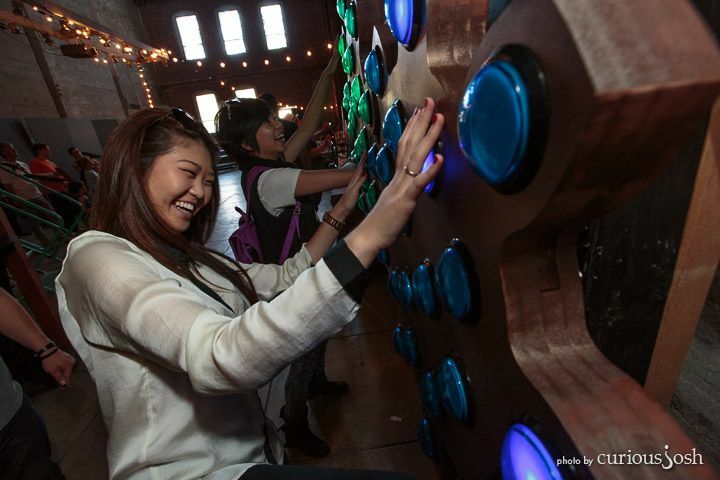 You need look no further than our signature game: the rotating Buttonwall Twister. Each gear panel features 21 giant arcade buttons, a SX1509 breakout board, some Darlington transistors, and a Raspberry Pi, all wired together on boards we manufacture in-house in small quantities. Our games generally incorporate some novel sensor or actuator, used in an unusual way. Often, those elements are integrated into an Arduino, Raspberry Pi, or Beaglebone. We also repurpose consumer electronics in unexpeced ways. I seem to find a way to stuff a Kinect camera or a Nintendo Wiimote into just about everything. Tell us about the initiatives and reasons to include at-risk youth in particular, as well as the plans to showcase kids' projects in the carnival. We really want to showcase kids' own work at the Carnival. We're going to have creative competitions, a digital art gallery, a concert featuring musical robots, and a fashion show of wearable electronics. We're designing kits for kids to use to to help them participate. We actually hope to get SparkFun involved in the kit-making process; SparkFun parts are a pretty important part of our toolbox. We recognize that not every child who will want to participate will have access to funds to purchase a kit so we've built a few solutions into the process. It's crucial we're able to level the playing field for kids, and give lower-income or at-risk youth equal opportunity to participate. Who knows, one day a Nobel prize winner could say: "It all started with building this musical robot for the STEAM Carnival, which led to a curiousity about science and engineering..."
To help this we've done a couple things. First, you'll notice a few Kickstarter rewards allow donators to sponsor a kit to be supplied to an at-risk youth. We'll be allocating those to local schools in at-risk areas. Second, we plan on enabling kids to have their own crowdfunding page to raise money to purchase a kit. We think that fundraising when you're a child teaches a lot of important lessons that create a strong foundation for being an entrepreneur and innovator - going door-to-door, telling your story with passion, rallying a community, etc. Overall, how will the carnival inspire a new generation to experiment and get involved in the STEAM fields? We really see two core elements at work here. First, it's not enough to have kids engage with the games, we need to help them make the jump from saying, "This is cool," to "I wonder how this works," and create the avenue for them to find out. This is one reason we plan on explaining how various STEAM elements were used to create each game. We want them to have an inside look and "spark" their curiosity. Second, and this is an equally crucial element, we need the adults in these kids' lives to be inspired as well. We need them to be excited and curious and to want to learn and play alongside the kids. Growing up, we had supportive parents who encouraged our passion to build games, and tinker with things, and experiment - all of which was instrumental to us pursuing the careers we have. Awesome job Eric & Two Bit Circus! In fact, we loved the project so much that SparkFun has sponsored a visit from the STEAM Carnival at our headquarters! If you're as into games and fire (and education too, yes) as we are, check out their Kickstarter campaign. Good luck guys! I have found students much more willing to engage in engineering when the problem they are solving is embedded in an artistic endeavor, STEAM Carnival is an awesome example of this! When you present engineering concepts and problems to students who are lacking in curiosity and/ or creativity, you get a flat return. With art, kids intrinsically get it! Art is context! This is brilliant! I have spent much of my life trying to turn STEM into STEAM, but certainly not on this scale. And aiming it towards at-risk youth is brilliant. 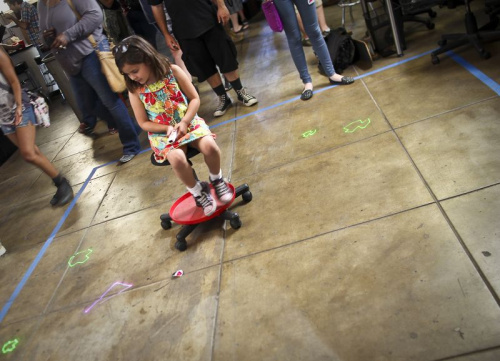 When art becomes interesting, or technology becomes entertaining, kids get interested. To a child, listening to a teacher drone on in Ben Steinian fashion about Ohm's law is not going to draw that child into electromics, but building an LED throwie is. Of course, there comes a time when you have to learn Ohm's law, but if the child's curiosity regarding how or why the LED throwie works is piqued first, they will be much more interested in learning about it. STEAM Carnival has my backing! A side comment on STEAM... Lately I've started doubling down on the meaning of M. Normally its Math, but I think we should consider it the acronym as Science Technology Engineering Arts Math/Manufacturing. All too often I run into STEM people who are not only object to Arts but are convinced that STEM should be about creating more PhDs. This, imho, is ignore-ant of the reality of PhDs and other advanced education. The USA system for PhD degrees is pretty much about creating professors - and free labor for them while PhDs are slaving away to get their degree. We do NOT need more professors. ok, maybe a few to keep pipeline full but there are lots of em in the works... far more than there are positions. And those positions are going to change as MOOCs change the face of education. What we do need are people who know how to MANUFACTURE stuff, especially on small scale, and to do design for manufacture. I couldn't disagree more. The whole point of STEM is that we need more college graduates with Science, Technology, Engineering and Math degrees. We certainly do not need more Art degrees (almost worthless except for the non-art education required to get the degree). And even less do we need to be college educated to get a job on an assembly line. That's not to denigrate artists and factory workers; I'm just trying to point out that not all occupations are well served with higher education -- it is pointless and a waste. I can already predict that the reason for the STEAM push is that the engineering impaired crowd is trying to shoehorn themselves in; but all they will do is water it down and make STEAM as worthless as the rest of the current educational system. Very cool! Now if I can find a way to get them to bring it to Maui. Eric visited us a year or two ago. Maybe we can get him back again. Big buttons in second photo looks great ? Where can i found them ? Big Dome Push Button - Blue also available in red, greenish and yellowish. awesome - just backed this!! Ahh, at first I thought this was steam powered or steampunk; that would have been cooler! Still sound really cool though. BTW, when did STEM turn into STEAM? As long as you are going to start including randomly unrelated fields, what about architecture and literature? STEAMAL anyone? Okay, hard to argue with Leonardo.